Flavorful and generously marbled, rib-eye makes a restaurant-worthy splurge whether at home or out camping, particularly when topped with a distinctively flavored butter. The amount of pistachio butter is generous; if you like, turn the asparagus in some of it right after the spears come off the grill and top the steaks with the rest. If you’re camping, do this before you leave home: Whirl pistachios and arugula in a food processor until minced. Add butter and whirl until smooth, scraping down inside of bowl as needed. Transfer to a small container and chill. Heat a charcoal or wood-fired grill to high (450° to 550°; you can hold your hand 5 in. above cooking grate only 2 to 4 seconds). Coat steaks and asparagus with oil and season with salt and pepper. Grill steaks, turning once, until done the way you like, 6 to 15 minutes for medium-rare. Grill asparagus in last few minutes, turning once, until tender-crisp. Transfer everything to a cutting board, dollop steaks with butter, and tent with foil. Let rest 5 minutes. 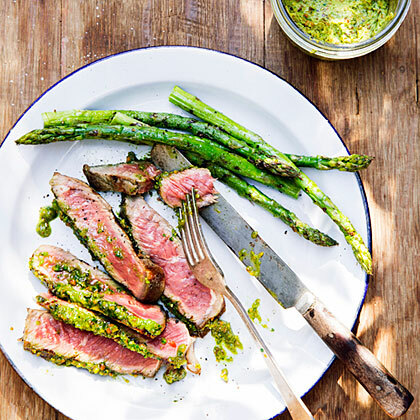 Slice steaks and serve with asparagus. *If you can’t find unsalted pistachios, use unsalted butter to balance the salty nuts. Make ahead: Pistachio butter, up to 1 week, chilled.